Quick post today guys, it’s been really busy again lately! Here are some more of Tim’s impressive collection of John Blanche inspired undead. This time we’ve got the first part of a unit of Black Knights. There’s something wonderfully understated about these models. I remember that even when they were released they had a very old-school, oldhammer vibe about them. Devoid of exaggerated, oversize weapons and garish bling, these models have a classic timelessness about them. There’s something wonderfully understated about these models. 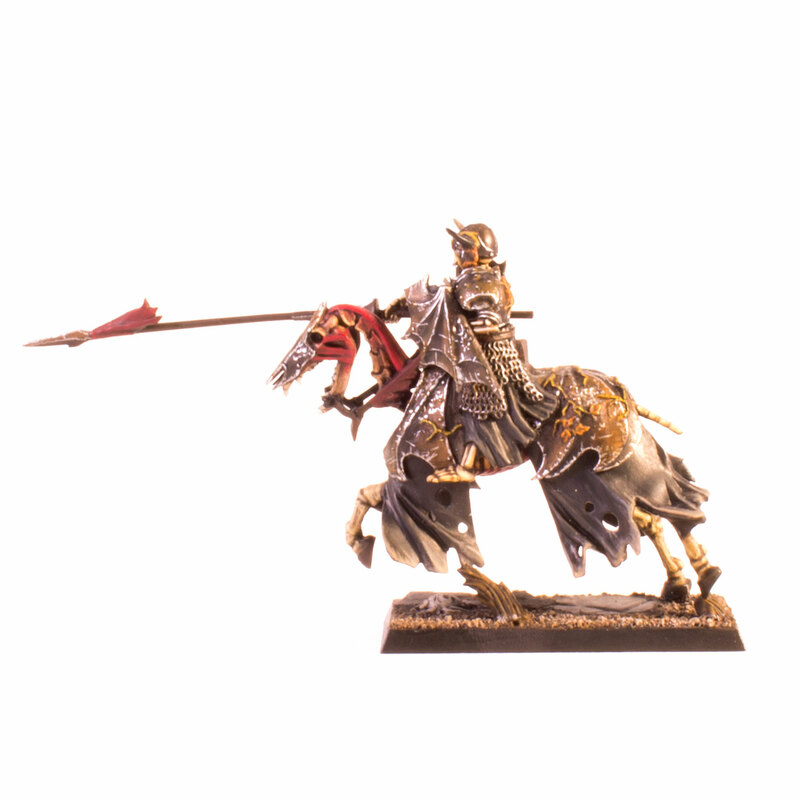 I remember that even when they were released they had a very old-school, oldhammer vibe about them. Devoid of exaggerated, oversize weapons and garish bling, these models have a classic timelessness about them.Such modest detailing was an excellent opportunity to work some freehand weathering on the barding and wight’s armour. I built up the effects or tarnish and corrosion with many thin washes of black and brown over an undercoat of Boltgun Metal. I then added applied thin glazes of Vermin Brown selectively to areas I wanted to appear streaked with rust. I then worked back over this with very thin edge highlights of Mithril Silver and tiny lines to emulate scratches and the ravages of time. I’d advise painting the arms and shields for these models as separate sub assemblies. It’s easier to glue them on at then end. 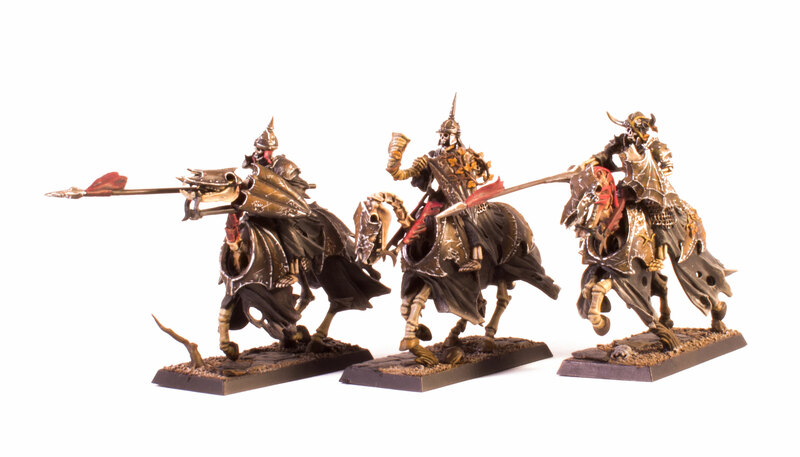 These are some of my favourite miniatures in the undead range – what do you think? 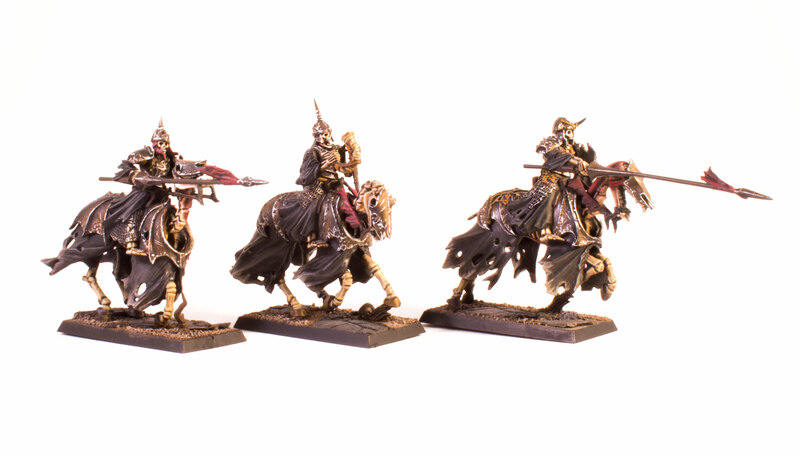 Do you like the timeless simplicity of the Black Knights or prefer the bolder, World of Warcraft style of Nagash and his Mortarchs? Have your say below! This entry was posted in Armies on Parade, Tim Price, Work In Progress and tagged #ageofsigmar, #warmongers, Age of Sigmar, Black Knight, Blanchitsu, Technasma, Tim Price, Undead, Warhammer, WIP. Bookmark the permalink.